The property is a warm, rustic retreat nestled in the Tasmanian wilderness, a superb escape featuring cosy cabins, fine food and wine and many activities. Guests can relax in a therapeutic massage or sauna at the Waldheim Alpine Spa. There is a daily activity programme as well as complimentary board games available from reception. Featuring private timber cabins set discreetly in amongst tree lined ranges and each cabin offers natural views whether it be of the Lodge Lake, the Pencil Pine River or the rolling hills and bushland expanse of Cradle Valley. The Pencil Pine Cabins are simple in style but are comfortable. The Contemporary Spa Cabins have verandahs, gas log fires, spa baths, and are well appointed. 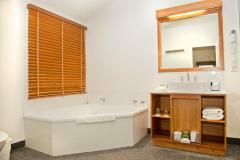 The Spa Suites are styled with hand made Tasmanian wood furnishings, log fire and deep spa bath. The King Billy Suites offer spacious rooms with separate sleeping and living areas, large deck with outdoor hot tub and are contemporary in design.